Currently reading "Istanbul : A Tale of Three Cities " by Bettany Hughes (2017). So far it has hit most of the major historical points of the city once known as Constantinople but now knowed as Istanbul, as per the They Might be Giants Song. Hughes starts of with the archaeology of the site which builds up to its settlement by Megaran Greeks, of a predominantly Dorian culture in the 7th century BC, Byzantos (Ox-ford) became part of the Via Egnatia under Roman rule, which consolidated its economic importance. This economic importance is discussed as one of the main reasons Roman Emperor Constantine I in 330 AD made it his imperial capital and Bettany Hughes describes its consequent accretion of Holy Relics to make it a symbolic center of a Christian Roman Government. Interestingly after it was conquered by Ottoman Turks in 1453 AD around Constantinople a site of Abū Ayyūb al-Anṣārī was "discovered", one of the companions of Muhammad (Sahaba). Although military campaigns and conquests are discussed, it is not a book about military activity but a discussion of the culture and experience (lives) of the occupants of the city that came sequentially to be known as Byzantos, then Konstantinoupolis and then ultimately Istanbul ("Eis tin polin" to the city) through this she supplies cultural information and conjecture on things ranging from the predominance of star and crescent moon symbols in the city under pagan Roman rule as part of the cult of Hecate, the importance of the Illiad to the citizens of Constantiople and the role of the Harem in economic development of Renaissance Istanbul.She tends to conjecture on the hidden lives that are not recorded in history, the woman, slaves, serfs and the existence of diasporas within the city reflecting its cosmopolitan nature. She devotes a whole chapter (and really who wouldn't?) to Justinian and Theodora (6th century AD) and conjectures that Procopius's description of Theodora's determined speech during the Nika riots was an insult because it challenged gender roles and portrayed Justinian as being more cowardly than his wife. Where possible Hughes's conjecture is backed up with historical and archaeological evidence, but the tone of the book is less academic and more casual, chatty, the book is meant to be entertaining and I think for the most part it is. 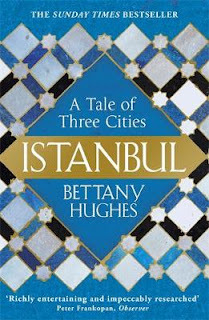 Really, the "Istanbul : A Tale of Three Cities" (2017) is a great source of cultural material that I haven't come across in the academic sources I have read, possibly reflecting how scanty my reading probably is and can be argued to provide a summarizing of the subject. You won't find a detailed analysis of the political machinations of Empress Irene (752- 803 AD), as an example of real life "Game of Thrones" but you will find a description of the Prince Islands where royalty was exiled to and the mention of the practice of rhinotomy and the sense of what life in the Imperial court may have been like. The following is a link to a lecture titled "Istanbul: The Worlds Desire", which is a title of a chapter in the book, which among other things, details the exchange of Constantinoples silk products as a prestige commodity during the early middle ages.